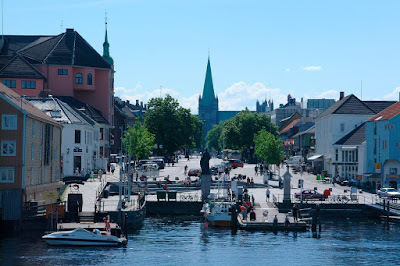 Trondheim lies on a sheltered peninsula on the southern shore of the deeply intended Trondheimsfjorden at the mouth of the river Nidelva in the middle of Norway. 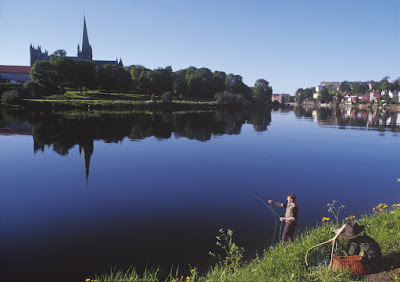 It was founded in 997 by king Olaf Tryggvason who build a royal residence by the outlet of the river. The residence was rebuild a few years later by king Olaf Haraldson, or Olaf the Holy, after a fire on the residence. 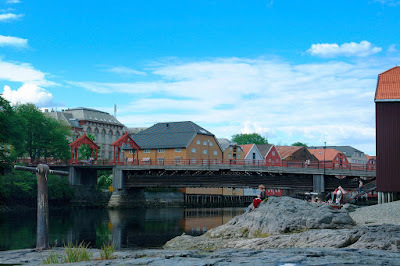 Trondheim has been very central in the history of Norway. 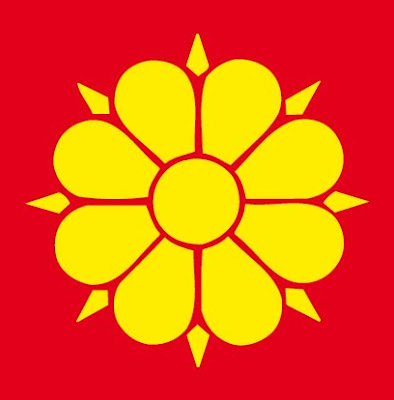 It was early made the capital city of the kingdom Norway. 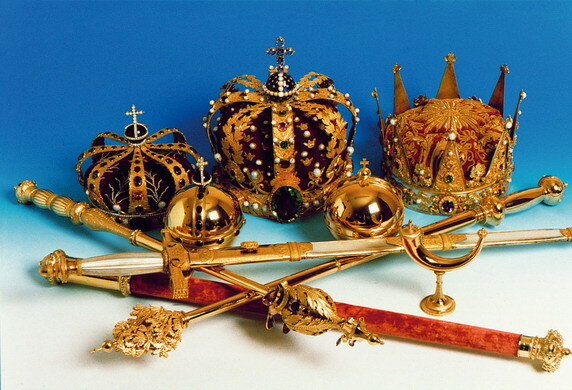 Kings have been crowned and blessed here, the church in Trondheim was a spiritual centre in Scandinavia especially from 1153 until the reformation in 1537, and the city is today the technological capital city of Norway. Trondheim is the third largest city in Norway. In 2011 it had 171 000 inhabitants. 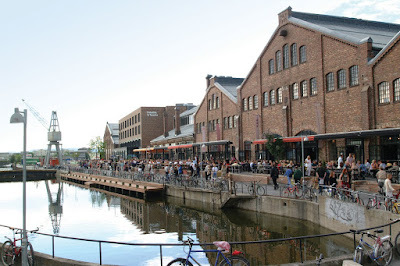 But since every sixth living in Trondheim is a student, the number of inhabitants is much larger. Trondheim was savaged by fire in 1681. When the city was rebuilt, Christian principles were obviously illustrated. 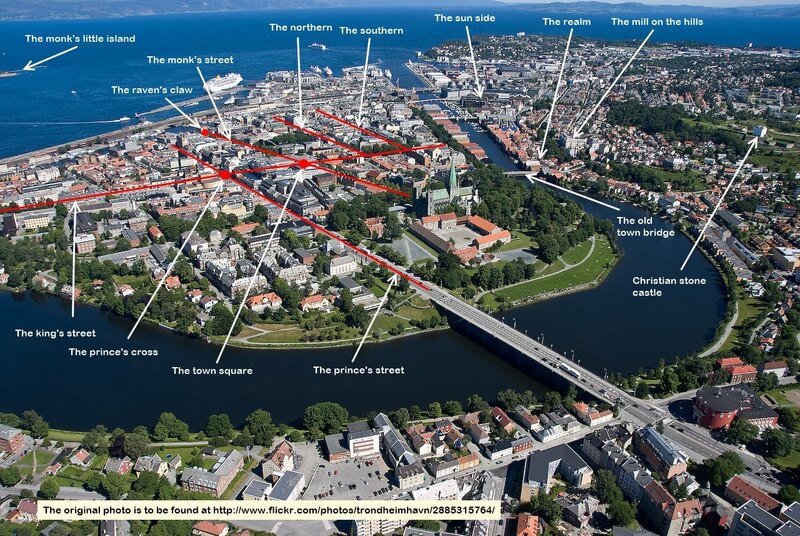 Trondheim illustrates the major Christian principles, and on this site I explain how. In the photograph we see the street Munkegata ("The Monks’ Street"), starting by the channel in the north and ending up by the cathedral in the south. The harbour by the channel is called Ravnkloa ("The Raven’s Claw"). Munkegata is the main street of Trondheim. It is far from being the most trafficked street, but most institutions of importance are located here. The street is divided like a spear or a sceptre, with the harbour at the bottom of the street, the town square in the middle of the street giving authority to the length of it, and the national cathedral at the top as the spear head. And so the street reminds of The Trinity of The Father (the harbour), The Son (the cathedral) and The Holy Spirit (the street as such). Historically the harbour was the main entrance to the city. Transport took place by the sea. The name of the harbour, Ravnkloa, meaning “The Raven’s Claw”, is biblical. Raven like birds, like craws, hawks, eagles and vultures, give life to other beings the way they feed upon carcasses. They transform the kill, they transform the being come to its death, to a higher being by justifying it. Jesus told us, when he said, speaking of the end times, that wherever the carcase is, there the eagles will be gathered. The eagle has thus been looked upon as a symbol of nobility. When the harbour is called “The Raven’s Claw” this must have to do with the fortune of the fishermen putting their lives on stake on the sea for the benefit of the people, selling the fish at the harbour, damned by their heroic act, possibly gaining nobility, or rather welfare, by their work. Or the name originates from the feeling people in general had when entering the city at the harbour. The city was the site of possibilities. The harbour is where life starts – where the seed is sown. The harbour is like The Father. The cathedral is where life ends and principles arise – where the yield is produced. The cathedral is like The Son. And the street Munkegata as such, uniting the harbour and the cathedral, is like The Holy Spirit. Along this street we find the royal residence in Trondheim, we find the court in Trondheim, and we find the administration of the municipality. Earlier we also found the administration of the region, of the county, here, and we found the military headquarter of the district here. 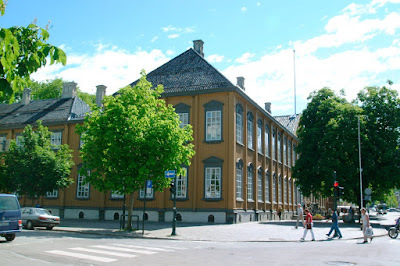 The oldest high school in Trondheim is also located here. Munkegata is the street of authority, is the main street, of Trondheim. Click to see the original size. By The Trinity man becomes a dweller. By the contradiction he becomes an inhabitant. The dweller, empowered by The Trinity, will be as a son to the Father by being the crop sowed, cultivated and harvested, and he will see to it he, being harvested, becomes something of worth, as bread is of worth. He will owe his life to The Trinity and be a pride to The Lord. He who is an inhabitant, empowered as a help-meet to God, will think differently. He will think of himself as absolutely not God but united with God as if man was the wife of God. And he will be occupied with uniting the contradiction so that he can inhabit God. According to The Story of the Creation contradictions can and shall be united in seven ways. The first day heaven and earth was divided. We found our way out of the opposition by the light being lit, by which heaven rules and earth works. The second day the waters were split, and the clouds in the sky were divided from the water on the earth. We found our way out of the opposition by the precipitation and the evaporation. The third day the land was split from the ocean. We found our way out of the opposition by the growth, which grows on land but which is upheld by water. The fourth day God let us find our way out of the opposition between day and night. We did so by the lights which were lit on the ceiling, confirming the light as such in three different ways. The fifth day the fishes in the water and the fowls of the air were created. And we want to be fresh as the fish in the water, and we want to be free as the bird. We found our way out of the opposition the sixth day by the creation of the animals on the ground, symbolizing rationality. Man was created the sixth day. By that a division was made between man and the rest of the creation. We found our way out of the opposition by letting the world suit and serve. The seventh day the last division was fully understood, being the opposition of man and woman, both created the sixth day. We found our way out of the opposition by the creation of The Son. Being by God, confirming God as help-meets, we will unite the oppositions we stand in. Making God valid, man and woman shall be one. The streets in the centre of Trondheim were drawn in 1681 after a great fire. They were drawn by Major, later General, Caspar de Cicignon, born in Luxembourg. East of the city centre, on the east side of the Nidelva river, we find the area Bakklandet (“The Land of Hills”). This is the realm of the city. Historically the Bakklandet has been inhabited by the labour force. And by Bakklandet we may make a distinction between the stomach and the hooves of the city, thinking of it as a creature, where the centre is the working hooves and the Bakklandet is the digesting stomach. Moses told us, in The Law, that when justifying creatures by eating them we should make two demands. The hooves of the animal must be completely split. And the animal must chew the cud. Speaking of split hooves there in the city centre of Trondheim is a clear distinction between the Munkegata and the streets Søndre and Nordre. Two principles are illustrated, and speaking of the execution of power, there is an obvious division between the two principles. Bakklandet, on the other hand, illustrates the stomach. And the animal should chew the cud. And in fact there on Bakklandet is a higher level area, called Møllenberg (“The Hill With The Mill”). This higher level of the realm of the city traditionally has been inhabited by more powerful people. The houses here are more luxurious. And so it is like the cud is chewed by the two levels of the realm, and in this respect the name of Møllenberg (“The Hill With The Mill”) becomes symbolic. Today the two levels of the realm are also united by a bicycle lift, called “Trampe” (the Norwegian word for what you do with your foot when you cycle up hills, or when you walk heavily). The lift was the first of its kind in the world. Today the area Bakklandet has been renovated. We find cafés here, and a walk in the area with the old buildings is very pleasant. What unites the city centre and the central realm is the old city bridge, called Bybroen. The bridge originates from 1681, when the city was rebuild after the great fire, and the bridge over the river Nidelva was then put here for military reasons. Earlier the bridge over Nidelva was placed further west. In 1681 there was a military control post on the western side of the bridge, and this was one of the city gates. The look of today, though, being the bridge with the portals, is from 1861. At that time the bridge was built so that it could be elevated. In the 20th century the construction was made to be of concrete. The Bybroen is made famous by a song, a waltz, of Oscar Hoddø. In the very popular song he referred to the bridge as the portal of luck and of happiness. The song is melancholic, written just after the German invasion in 1940, and was very important to the generation of that time: At least the bridge was intact. trusted, a place to me dear. after the taking of care. coupled and shining in stardom we are. here as I walk by, dreaming. Up hills from the Bakklandet, on a brink controlling the city, we find the fortress Kristiansten festning. The man's, the king's, name "Kristian" means “Christian", and so "Kristiansten" means "Christian Stone”. And speaking of what really is important to defend in Christian faith we of course come to the conclusion faith itself is. Faith makes us independent. And what really shows faith is the child. Jesus pointed this out to us, saying that for him who made a child fall from innocence and faith, for him it was better if a millstone was hanged around his neck and he was drowned in the depth of a sea. And Jesus told us to be like children again. The kingdom of Heaven belongs to those who do. Faith, as the readiness of innocence, is the corner stone of what Christian is. 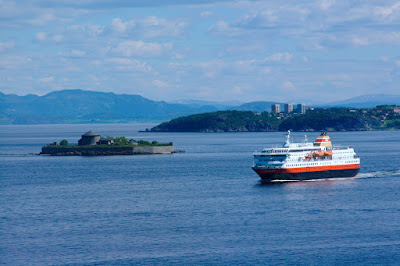 And the fortress Kristiansten festning is a symbol of independence. We may build spiritual fortresses to defend faith. The fortress was build after the great fire in 1681. The hills upon which the fortress is build had shown themselves to be of vital importance to keep control over during earlier Swedish invasions, and a garrison was placed on the fortress. The only time the fortress was put to test was during the Swedish invasion in The Great Nordic war in 1718. The Swedes surrounded the city. 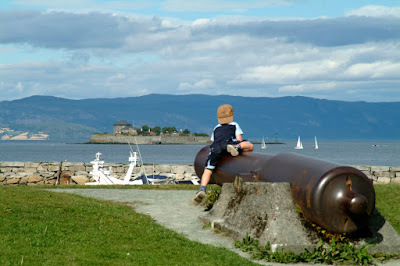 The soldiers at the fortress suffered from starvation but the garrison in Trondheim withstood attack. During World War II Norwegian patriots were executed on the fortress by the Germans. And after the war, some convicted war criminals were executed on the fortress by the King of Norway, among these Gerhard Flesch, the head of the Gestapo in the district, and Henry Oliver Rinnan and nine of his men, a gang hated for torturing Norwegian patriots during the war. On the fortress today salute guns are placed. The fortress is a peaceful spot and as such a recreational area for both citizens and tourists. In the middle of Munkegata we find the Torvet, the town square. 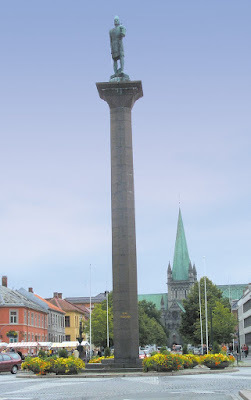 In the middle of the town square there is a statue of king Olaf Tryggvason, the king founding Trondheim. He is famous for being the first Christian king of Norway. He put his life at stake, and died in a battle in the year 1000, for the sake of Christianising and uniting Norway. And so he is a symbol of responsability. The word of Jesus was, that seeds which are not sown will only be themselves, but seeds that are sown will become something. As seed Olaf Tryggvason became a harvest. At summertime a little marked is put up in the town square. Fruit and vegetables are sold, often from local farms. The strawberries from the district of Trøndelag are especially sweet and are highly recommendable. Up hills from the Bakklandet and the Møllenberg, some kilometres eastwards, we find the Tyholttårnet, in English “The Tyholt Tower”, built in 1985. 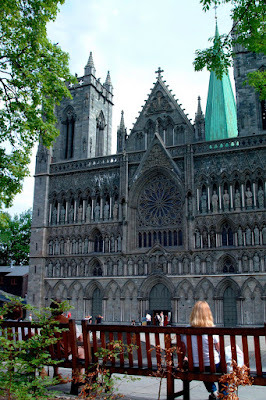 It is said to be the second biggest tourist attraction in Trondheim, beaten only by the Nidaros Cathedral. The tower is a 124 metres high radio tower with a restaurant 80 metres up, which makes a 360 degrees revolution per hour. The view from the restaurant is spectacular. When sitting there we may reflect upon judging. We remember the words of Jesus was that we should not judge, and he said that the way we judge others, in the same way we would be judged ourselves. And Jesus said that we should let our communication be yes – yes or no – no. Anything more than this, said Jesus, comes from the evil. And we may reflect upon how it is to be a ruler. When Jesus was taken to the Romans, to Pontius Pilatus, the chief, Pilatus wondered why Jesus would not be a fool. He wondered why Jesus would not serve the eyes of Pilatus. He asked Jesus, do you not know I have the power to crucify you and to release you? But Jesus let him know he had no power if it was not given him from above. And so Pilatus himself was a private – just like anyone else was. And therefore, said Jesus, the one giving Jesus to Pilate committed the greatest sin. By doing so he made the situation intolerable to Pilatus. The situation was. Pilatus would be a despot if he tortured and killed Jesus and he would face court martial for challenging the emperor in Rome if he did not. And so Pilatus washed his hands when sentencing Jesus to die on the cross. Doing so would be weak for a man in authority in most situations. But by doing so he showed himself to be a private, a citizen himself. He was not God or godlike. And so The Principle of Legacy was instituted. We should not be afraid of having to be fools when facing the king, when facing the authorities. What the king thinks about us should be of no importance. The important thing is that we adhere to the laws and the rules of the king. By doing so we are free. The Principle of Legacy and The Principle of The Separation of Powers are the two core values of the Christian constitution. They principles were paid much attention to in the lawmaking of the Norwegian constitutional assembly at Eidsvold in 1814, both in the work of the assembly itself and in the formulation of the constitution. The Principle of The Separation of Powers is the man’s most important principle in his relation to God. The principle of Legacy is the most important principle to the woman. And in the relation between man and woman the man should make the constitution and the woman should make the laws. The man should work out the principles. The woman should work out the rules. And both the man and the woman should follow them. 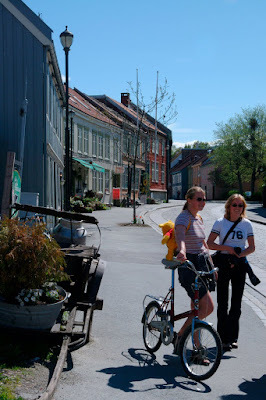 In the centre of Trondheim there are three streets given the names of the titles of the royal family. The Kongens gate, in English “The King’s Street”, goes from west to east and is the longest street in the city. 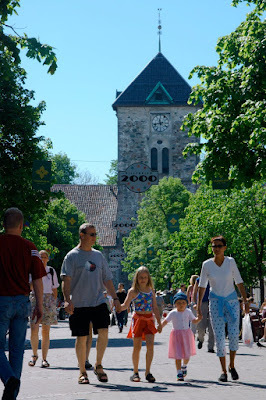 It is the main entrance to the city from the west and begins by the ancient city gate and ends by the river Nidelva. North of The King’s Street and parallel to it The Queen’s Street goes. In Norwegian it is called Dronningens gate. It is not quite as long. In the city centre both streets are crossed by The Prince’s Street, in Norwegian Prinsens gate. The Prince’s Street is the main entrance from the south. It begins by the river Nidelva and ends by the channel. By the crossings we are reminded of the position of the son in the family, being his father’s faith and his mother’s hope. The son will excuse him being his intention and reveal her being her aim. The crossing of The King’s Street and The Prince’s Street is called Prinsenkrysset, in English The Prince’s Crossing. This crossing is a symbol of Christianity, of belongingness to a family and of love to the son. A man principally thinking his son in every action will be reliable. A derision of faith was the establishment of the Gestapo headquarters in the Missionaries Hotel by The Prince’s Cross during World War II and the torture of patriots finding place here. Today The Queen’s Street is known for – the buses. Believe it or not. 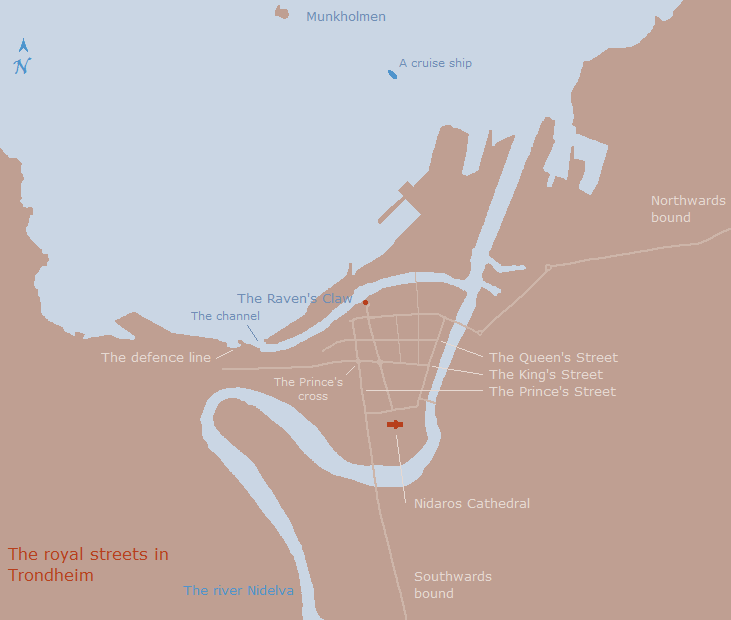 The Queen’s Street reminds us of collective transportation. 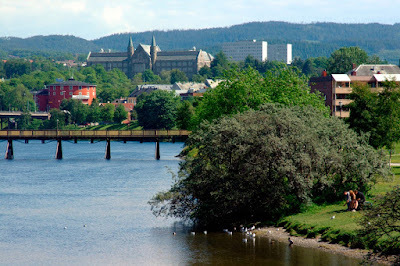 The photo is taken from the entrance to the city from the west and shows the old building of The Norwegian Institute of Technology on the other side of the river Nidelva. The red building is the Samfunnet, in English “The Society”, the meeting place for students. 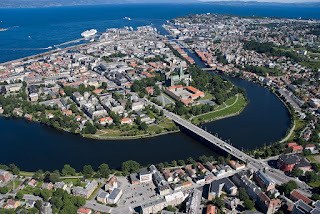 Trondheim is said to be the technological capital city of Norway. And Trondheim is the prime seat of the Church of Norway. And so we are reminded of what seems to be a dilemma, between believing in technology and what the senses tell us or to be governed by faith. We are reminded of the conflict between the theory of the evolution and the Story of The Creation. In that respect we remember that the sisters Martha and Maria, both friends of Jesus, acted differently when Jesus visited them. Martha was occupied with making the meal and with making it cosy. But Maria just sat down by the feet of Messiah and listened to him speaking. When Martha complained about this, Jesus said to her that you, Martha, is cumbered with many things. But one thing is necessary. Maria, said Jesus, has chosen the good part, which shall not be taken away from her. Living in darkness as we do in this world we may either be enlightened by making the stars valid or by making the moon valid. By making the stars valid we will mirror the sun by the multitude. By making the moon valid we will mirror the sun by the merit. And the necessary thing is to mirror the sun by the merit, as the moon does. The Norwegian Institute of Technology was established in 1910 after the decision to place a national college of technology in Trondheim was made by the Parliament in 1900. From the college were graduated charted engineers (master level) and charted architects. The college was united with the university of Trondheim in 1995, but the importance of the college is verified by the fact the new university was called the Norwegian University of Science And Technology. Charted engineer students had a prominent place in the hearts and minds of the people of Trondheim in the 20th century. By the outlet of the river Nidelva, on the eastern side, we find an area called Solsiden, in English “The Sun Side”. Inside old factory buildings we find a shopping centre and on the outside of it, facing the sun, we find numerous cafés located side by side. This area has become a meeting place in Trondheim. By the shopping centre and the cafés we are reminded of a distinction between worrying about clothes on the one side and worrying about necessities on the other. We are reminded about the worries of living. And we remember Jesus clearly stated we should not worry about what to eat. The fowls in the air, said Jesus, do not sow, they do not reap, and they do not gather into barns. And yet the heavenly father feeds them. Are you not much more worth than fowls, asked Jesus. Which one of you, asked Jesus, can add as much as a cubit unto his stature by taking thought? And he told us to look to the lily. Lilies toil not, they do not spin, but even Salomon would come short the way they are arrayed. If grass is clothed the way grass is, which today is and tomorrow is cast into the oven, should not you be clothed much more? You are of little faith, said Jesus. And he told us not to take thought of tomorrow, for the morrow shall have its own worries. Sufficient unto the day is the evil thereof. Said Jesus. The old factory buildings at Solsiden were left by the Trondhjems Mekaniske Verksted, in English the Mechanical Factory of Trondheim, a shipbuilding company, when the company was closed in 1983. Trondheim is situated by the fjord. And by the fjord there is a channel, beginning by the ancient gate of the west and ending by the Nidelva river in the east. The place where the channel begins is called Skansen, meaning “The Defence Line”. Here one controlled the entrance to the city from the sea. Norway is known for its fjords. The fjords make us special. If the sea is our feelings and the land is our consciousness, it is like the feelings have made attacks on the consciousness by the fjords. And the consciousness has let the feelings do so. Fjords are established as symbols of marriage. But the fjord is to be grasped also in another sense. In the story of the creation a clear distinction is made between necessity, usefulness and loveliness. The plants are of three kinds, being corn, herbs and fruit trees. The plants symbolize values. The animals on the ground are of three kinds, being creep, cattle and wild animals. The animals symbolize sensibility. And there are three kinds of light on the ceiling, being the moon, the stars and the sun. The lights symbolize spiritual enlightenment. And in Norway there are three kinds of water. There are the ocean, the fjords and the lakes. There are faith, hope and charity. Only the pure watered lakes are true charity. But the fjord is to have expectations to. It seems like it wants to be a lake, exactly the same way as cattle seems to want to be wild animals. The Trondheimsfjord is 130 km long. It is an inlet of the Norwegian Sea. At least 90 species of fish has been observed in the fjord, and the fjord has the richest biological life of all Norwegian fjords. It was an important waterway in the Viking age, and it still is. 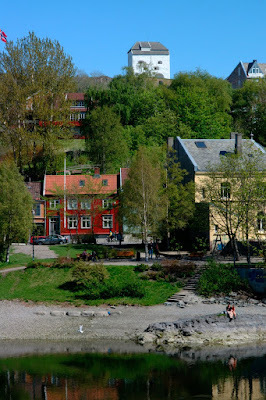 The ware houses by the river Nidelva give witness to the historically importance of the fjord.